When Placing your order online though my website above, you will see a Red Promotional Box at the bottom of your order form before you check out . Inside this red box you will see the amount of FREE Sale-a-bration items you will get to choose from for your order of every $50.00 in merchandise you purchase. You will need to click on the CLICK HERE in this promotional box. 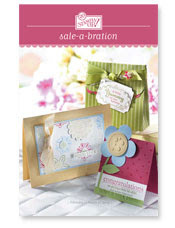 This will allow you to add the Sale-a-bration items to your order. There are no other prompts for this! Please do not hesitate to contact me if you have any questions! Just click on my website above to order or click on the picture to the right to see the SAB mini catalog offerings. I'll be posting lots of projects made with the SAB items this week, so check back often! Have a "SUPER" Sunday everyone!